These are our top picks for Liturgy of the Hours apps (also known as Breviary or Divine Office). We include versions for non-Roman Rite as well as Roman Rite, depending on the app. We also include in our list apps for both Ordinary and Extraordinary (Latin 1962) Roman Rite liturgies. Need a free online Liturgy of the Hours for the Latin Rite? This site has each day of the year linked. 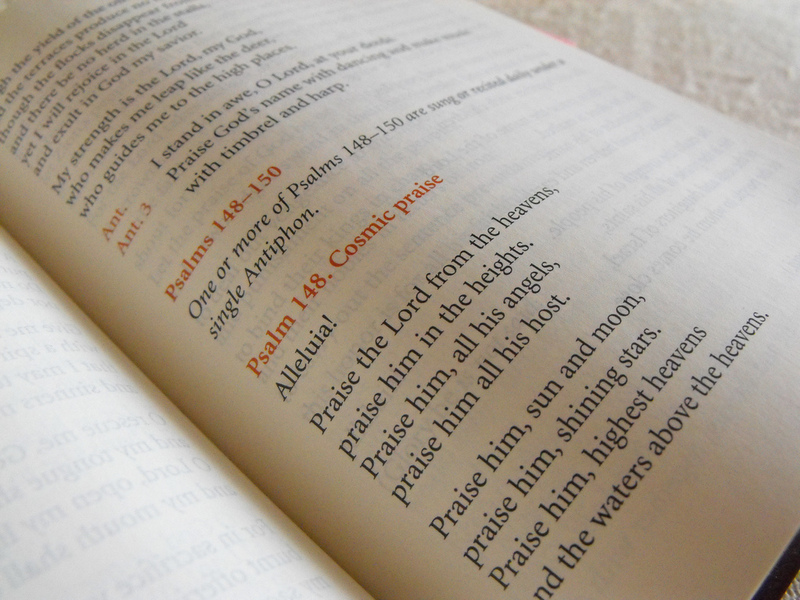 Need to learn how to pray the Liturgy of the Hours? Go to the blog, Coffee and Canticles, for excellent instruction and resources for laypeople. a complete Missal (including priest’s sacramentary), text for various Rites (not just Roman) –all the rituals and texts for various Catholic celebrations like Sacraments, Eucharistic Adoration, Blessings, etc. Includes the new English translation of prayers from the Roman Missal (3rd edition) This is noticeable in the Breviary in the closing prayer and penitential rite in Compline. It includes an optional closing prayer in the “old” (2nd edition ) English translation which is useful if you are praying with others using print Breviaries. iOS version includes a spiritual diary wherein you can jot down your personal thoughts and share liturgical texts via social media. Previous day’s Compline is an option each day. Pros: A beautiful digital version of the print version you are used to, complete with “church font” and rubrics. Cons: Doesn’t match the print version entirely –the readings are often much shorter than those in the print breviary (make note of this when you pray with others using the print version) Calendars aren’t biased to United States saints/feasts. Hymns do not match with the printed books here in the U.S. Annoying when you’re trying to pray with a group using print books and iBreviary. This world-class app also includes blessings and a fine selection of Catholic prayers. This is the best app our priests have tested for use as a Sacramentary when saying Mass using a tablet. See our review under Missal Apps. Its web interface makes the app accessible from anything with a browser (gaming device, etc.). A recent update added some nice features to the iPhone version like an automatic download of the day’s prayers when you open the app, choice of fonts, Compline for the previous day (in case you want to pray in the middle of the night). You might also like the fact that they include an automatic text scroll option so you don’t have to constantly scroll with your thumb while you pray. Set the font to a larger size if it scrolls too fast for you. Finally, audio is also an option in settings. It’s ok as long as you don’t mind your liturgy prayed in a robot voice. Proper texts for religious orders are included as an option: Augustinians, Franciscans, Holy Land, Mercedarians, Missionaries of the Precious Blood, Passionists, and Salesians. Note for Android users: If your phone is not compatible with the app offered on the Android market, download the APK and install it manually on your smartphone. Divine Office Temporarily not available due to licensing issues. If you purchased AND registered this app before June 6, 2016, it should work on your device and you can still access content on its web site. But you had to have registered, even if you owned the app, previous to that date to access the web site. This is a full-feature audio and text App for iOS iPhone and iPad ($9.99), Android phones and tablets ($5.99) Mac OS X ($9.99) A less “less sophisticated” version is available for Nook ($14.99) and Kindle Fire ($7.99). If you just want to read your Office off your computer screen, simply go to the home page of their web site and the day’s prayers are all set in order for you in a beautiful layout which includes the ribbon settings (ooooh!) for any print version you choose. Divine Office offers the approved texts for United States with a bias towards the U.S. calendar. You get all the principal hours of the day in text AND audio with introduction about the day. Download includes the entire day, so you cannot select the hours you wish to download. The purchase of Divine Office app provides you with the same content available on the DivineOffice.org website, complete with music, chimes, etc. that add to the beauty and the time (approx 20 min). If you want a sense of praying with others in a virtual monastic environment, this is your app. You can upload up to a week ahead (and one day behind). The app will automatically download the day’s audio and text Liturgy. You can download the next few days without connecting to a computer. Wireless connection without iTunes synchronization so you never need to connect to a computer for updates. You can download all these same audio files for FREE as a Podcast at DivineOffice.org. This podcast loads into iTunes or you can get it direct off their web site. While Some criticize the pious recitation of the prayers as a little on the sappy side, I personally love this version (as an App or Podcast). Tasteful & elegant interface to go with excellent studio production quality. On iPhone/iPad only you get a tracking component so that you can see a graphic of the globe with little points of light that indicate who is praying the Hours with you in real time around the world! How cool is that? Watch the video demo explaining all the many aspects of this well-developed program. One priest noted that the use of several readers in the production is consistent with the Church’s notion that this form of prayer is ideally communal instead of private. The cast of readers brings the listener into a community atmosphere of prayer. Over time you get familiarized with their voices which further adds to the familiarity of the experience. SPECIAL UPDATE! iOS version has been upgraded to Divine Office 2 ($24.99) which is a separate download which you must pay for. If you already own this app on your iOS device, then you simply pay the difference in price between what you paid originally and the upgraded price (generally around $5.00). Please see this video to learn how to upgrade. You need to upgrade ON YOUR DEVICE in order to get to the new version. Do not go to iTunes on your computer to upgrade. What’s in the new version? You get improved navigation with a side-bar menu; ability to download up to 21 days in advance; ability to download religious art for the day’s feast; a Roman liturgical calendar. Laudate (Free) iOS and Android, Kindle Fire This probably is the #1 free Catholic app because it is the most comprehensive. Available in English, Español, Português, Italiano, Bahasa and Polski, Slovenian. Among other features it offers Liturgy of the Hours. In English, it is the British version, so it may not match up with the text of others in a group setting. Universalis ($15.00) iOS (including Apple Watch) , Android (including Kindle and Kindle Fire)– Roman Calendar, Liturgy of the Hours, Roman Missal (English 3rd Edition), Saint of the Day, and more! View the calendar and the Mass readings on the Apple Watch. For other platforms, you can go to their web site where they suggest setting up the daily email service of whatever texts you want each day (Mass readings, Breviary etc) or creating your own e-book of their extensive offerings to read on your device. Of course, you can view everything on line for free; it is set up for mobile viewing. Once you download the App, you get it all forever–equivalent of 5,000 pages! And this one-time subscription covers all your devices. YOU GET… liturgical calendar for every year from 1970 to 2300 and beyond. Feasts and celebrations according to the General Calendar and the local calendars of the UK, the USA, Australia, New Zealand and South Africa, Ireland, and others. Also features “About Today” pages giving more information about the saint of the day. You get all 7 daily prayers for the Liturgy of the Hours; the Mass readings for yesterday, today and the future and the Roman Missal (updated 3rd edition in English). You also get Mass Today – A single page that gives you the whole of the Mass of the day: the Order of Mass with all the readings, antiphons and prayers filled in. For about $30 you can get a registration code that allows you to download all their text on demand in addition to the apps. This one-time payment is a great price considering you’ll have all that text available in perpetuity to print as you wish. The downside? While the language is English, the Breviary, Mass readings and psalms are not necessarily the approved translation for your country (although developers say several translations are available in the app version as opposed to the web version). The app is strictly text, no audio, and it is expensive in relation to the app market; nevertheless, it’s complete (minus the hymns) and there’s nothing more to download as it comes loaded. Does not require internet connection to operate, so this app comes in handy when in a pinch. It is my last-ditch emergency app for the breviary. E-Breviary pdf download ($29.95 annual subscription) This isn’t an app but …it’s another way to read Liturgy of the Hours on your computer or mobile device. E-Breviary is a service that offers downloads of .pdf files of the principle hours of prayer: Morning, Day, Evening, Night and Office of Readings. You can also read them on line on your computer’s browser but NOT your mobile device unless you download the pdf files first. These approved texts (North America) are offered in a format just as they are printed in your breviary (“church” font with red rubrics). Very nice to read on your computer screen, mobile device or as print-out. Because these are pdf files, you can zoom in for easier reading. Great for dark situations where you can’t have light on. Nice to have available on my laptop or mobile device, especially when traveling. For mobile device you need to download a week’s worth of pdf files to your computer and then transfer them to your mobile device as most mobile browsers do not support e-Breviary’s pages. Visit e-breviary.com to subscribe. You can make payment on line via PayPal. iMass ($1.99) for iOS and Android. This app contains traditional (NOT the current) versions of the Breviary in Latin. These versions include Tridentine Monastic, Tridentine 1570, Tridentine 1910, Divino Afflatu, Reduced 1955, Rubrics 1960 and 1960 New Calendar. Zoom pinch feature can be used for the missal and breviary text which is offered in split-page English/Latin. You can set preferences for type in text and rubrics. More info. is at the iMass web site. Brought to you by the Priestly Fraternity of St. Peter, this app is supremely easy to use. As its name suggests, it also provides a complete missal– the text of the Mass of the day according to the 1962 Missal (Latin on left side and English on right side in landscape format)–so you can use it for participation at Mass. BUT you must have internet connection to use this app. See our Missal Apps page for more information on that feature of this app. Praystation Portable Podcast (Free) Download from iTunes or off their web site. This is a podcast of Liturgy of the Hours for every day of the week. It uses the approved English translations. If all you want is a simple dry read–including the hymn!–this is a great choice. This plays on any device that can play MP3 files. New podcasts can be uploaded WIRELESSLY if you have that connection ability. So, you don’t need to go through iTunes. You can also play the podcast direct off the internet without any downloading if you are so connected. Of course, you can download the Hours up to three or four days ahead. Ideal when I’m on the road (literally) or at night when I don’t want to have light on to read or when I just want to close my eyes to pray. The downside to this podcast is that some listeners find that the reader reads too fast and would prefer hymns to be sung. If you need reading to be at a slower pace, Divine Office podcast is your best option. Divinum Officium is still available as a free download for old-style office. For PC, but is contained in “1962 Missal” android app.